Panoramic view of the city of Honolulu as day turns into night. A lone fisherman cast his line into the warm waters of the Pacific. 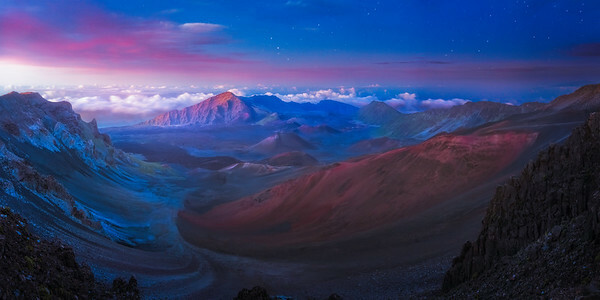 I made the trek to Haleakala National Park with the intention of hiking into the crater and photographing the rugged landscape. As I started my decent into the crater a thick layer of fog rolled in, derailing my plans. I quickly turned around and hiked out, I made it out with just enough time to hike to the summit of the mountain for the sunset. Sometimes things don't go as planned, but in this instance it worked out great. I was able to capture an amazing sunset at the pinnacle of Maui. 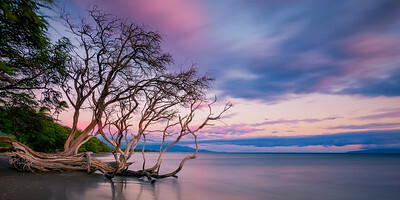 A tree topples over the rocky shoreline on the road to Lahaina, Maui. 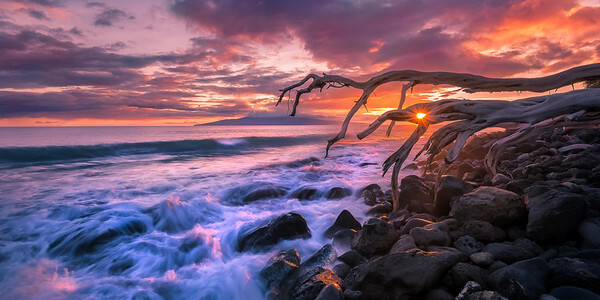 The branches of the tree bear a similar resemblance to out stretched hands reaching for the pacific ocean. As the morning light peaked over the horizon, I was well on my way maneuvering through the twist and turns of the 60 mile stretch of the Hana Highway. I was heading to the remote town of Hana, on the far east side of Maui. The drive along the Hana Highway is breathtakingly beautiful, but I often forget to slow down and enjoy the journey. I'm always in a rush to get to where I'm going and I don't take enough time to slow down and appreciate the beautiful place that I live. On this trip I took some time to explore and photograph the amazing journey. 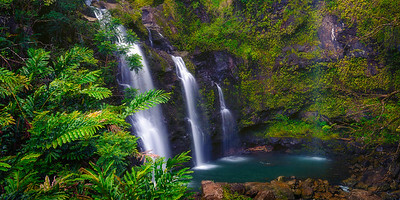 Here is a brisk morning photo of Upper Waikani Falls, affectionately nicknamed Three Bears Falls, found right along the road to Hana. A warm burst of sunlight breaks through the outstretched branches of Japanese Maple Tree on a cool Autumn morning. 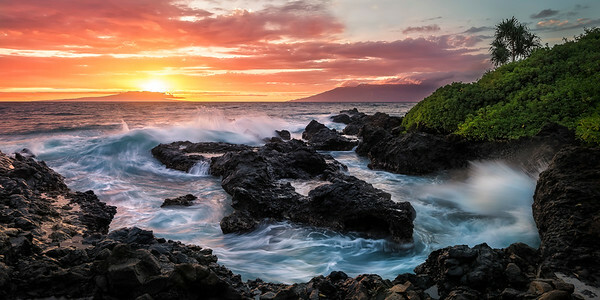 Makena Beach is a favorite spot for Maui residents and tourist alike. 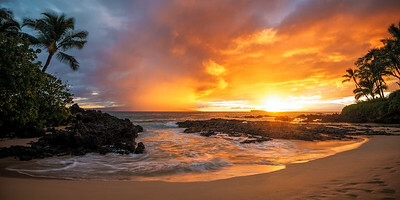 It is one of Maui's largest beaches, known for its golden sand and large shore break. 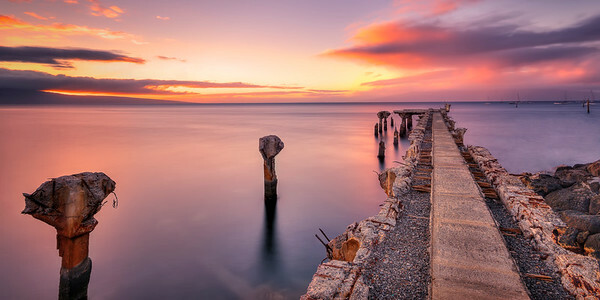 On this calm morning before the crowds of beach goers arrived a morning glow filled the distant sky. I was extremely lucky to have a crystal clear morning that provided an unadulterated view of the islands of Kaho'olawe and Molokini. The amount of detail I was able to capture of these two neighboring islands is amazing. 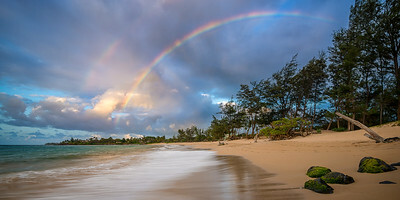 Rainbow over the quaint town of Paia, Maui. A surfer admires the last moments of the day as the fading sunlight is replaced by the lights of Huntington Beach Pier. 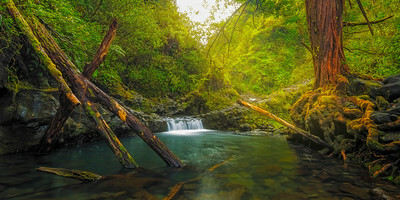 I found this beautiful location while exploring East Maui. I hiked here in the morning as the rising sun broke through the valley. The scene was so surreal that I had to capture the moment with my camera. 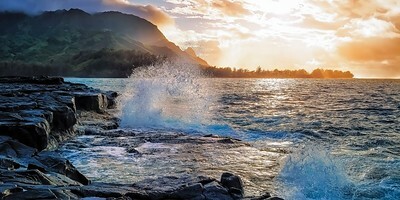 With the sun setting quickly and the rain clearing for a few minutes I was able to capture this spectacular scene of waves cashing into the shore while the Na Pali coast is blanketed with sunlight. The morning rays break through the vibrant orange canopy of a Japanese maple three.